What better way to celebrate this special day than with this creepy billboard for Silent Hill at Universal Studios Hollywood's annual Halloween Horror Nights. 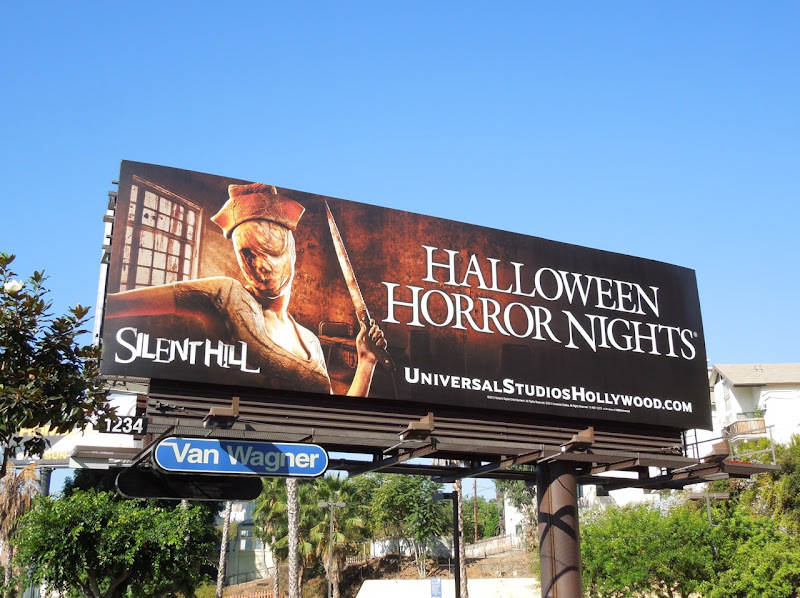 It's also the perfect promotion for the latest Silent Hill movie sequel recently released, Silent Hill: Revelation 3D, based on the popular video games of the same name. In the run up to Halloween the theme park transforms at night into a world of haunted houses, scare zones, creepy mazes and actors dressed as your favourite horror villains and creatures to give you a real fright or two. 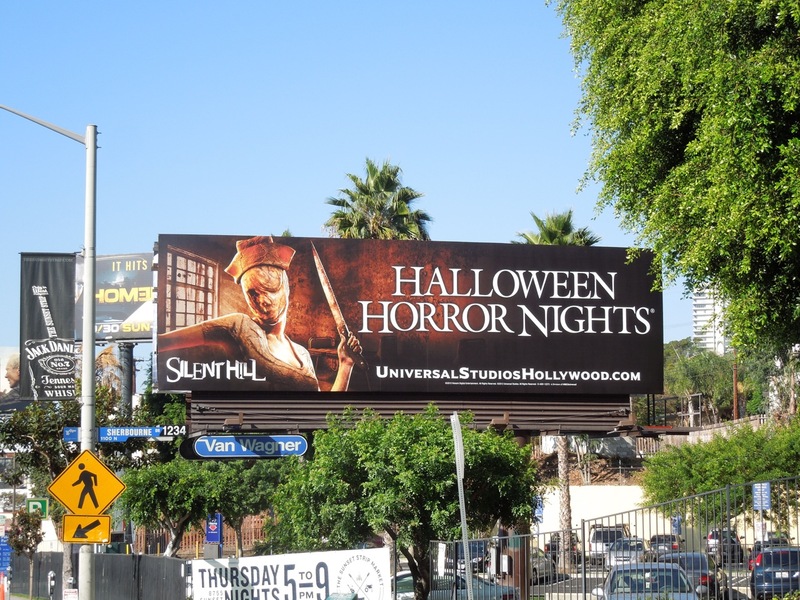 This Silent Hill themed creative was spied along Sunset Boulevard on October 1, 2012. 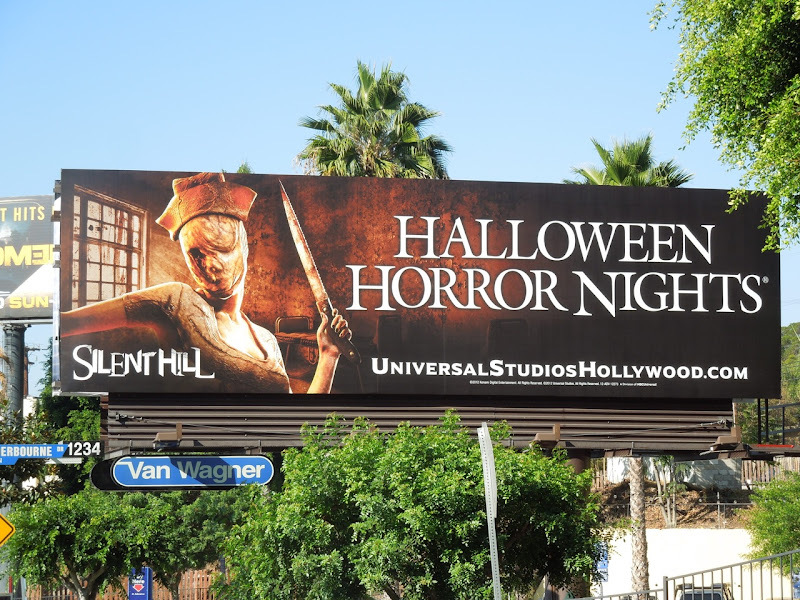 If you like this, be sure to also check out this year's Halloween Horror Nights Walking Dead billboards, plus if you're a lover of All Hallow's Eve take a look at all the Halloween themed billboards here at Daily Billboard. 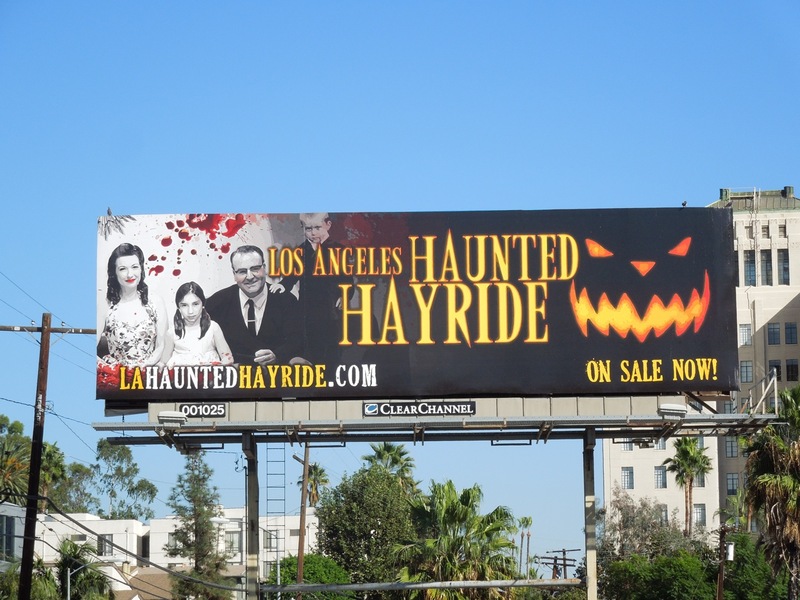 Happy hauntings to all you ghosts, ghouls and goblins. 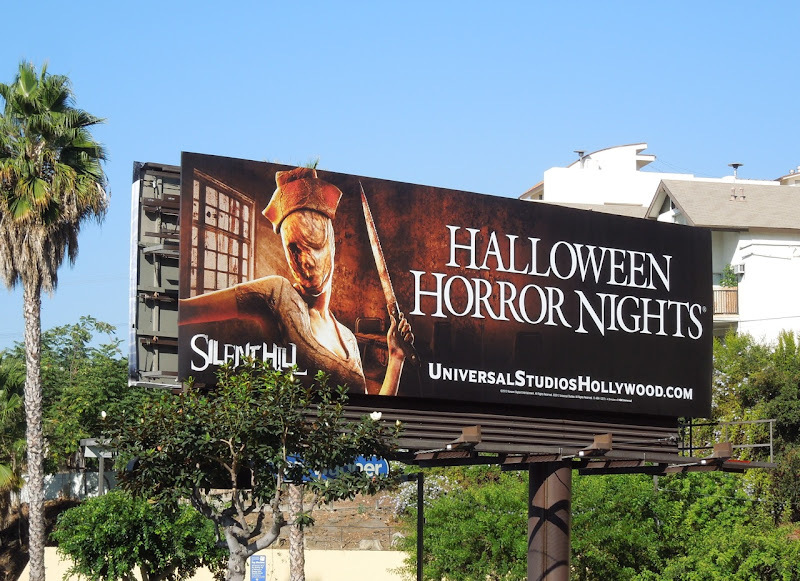 Halloween comes but once a year and we're going to make the most of it this week at Daily Billboard. This billboard for L.A.'s annual Haunted Hayride employs that familiar horror trope of the tragic family photo with a sinister past. 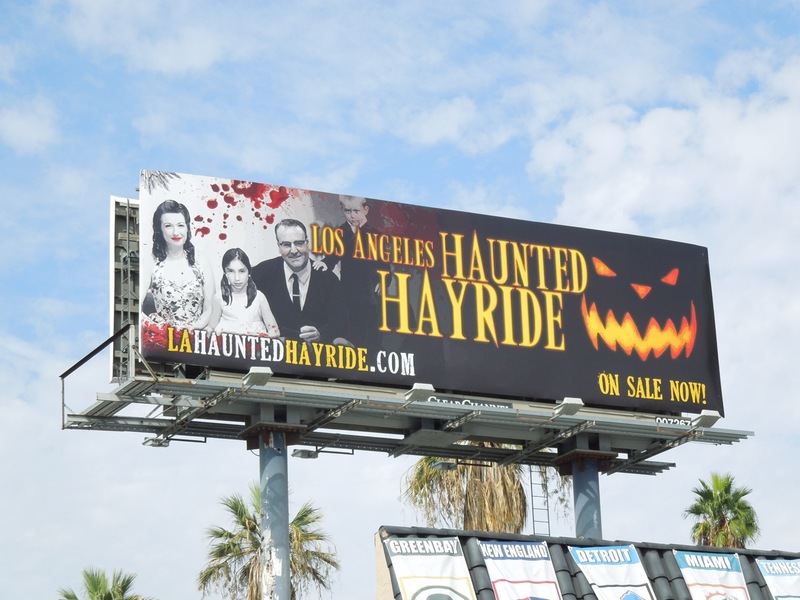 Indeed this mono family portrait splattered in blood hints at murderous goings-on, and if that's not enough there's also a great big Jack O'Lantern to get the Halloween message across. 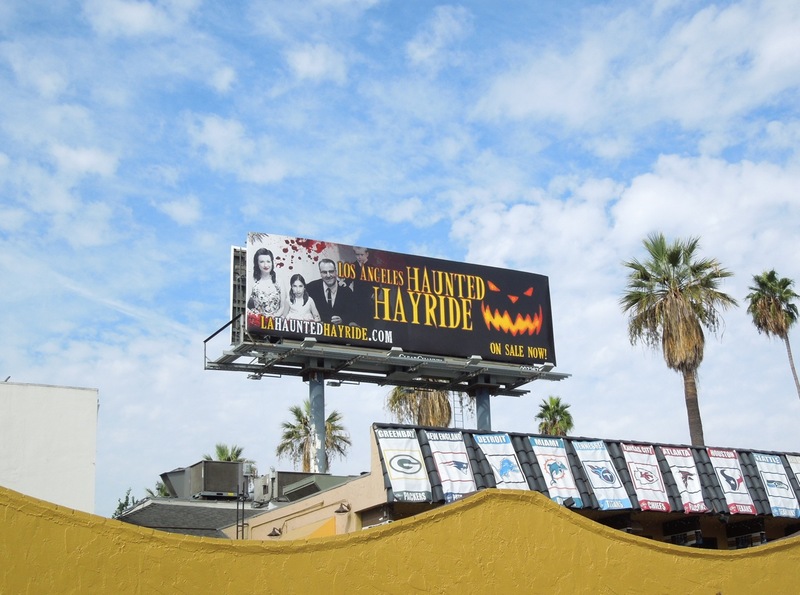 This suitably spooky billboard creative was spied above the Happy Ending bar along Sunset Boulevard on October 6, plus along Highland Avenue at Franklin Avenue on October 26, 2012. 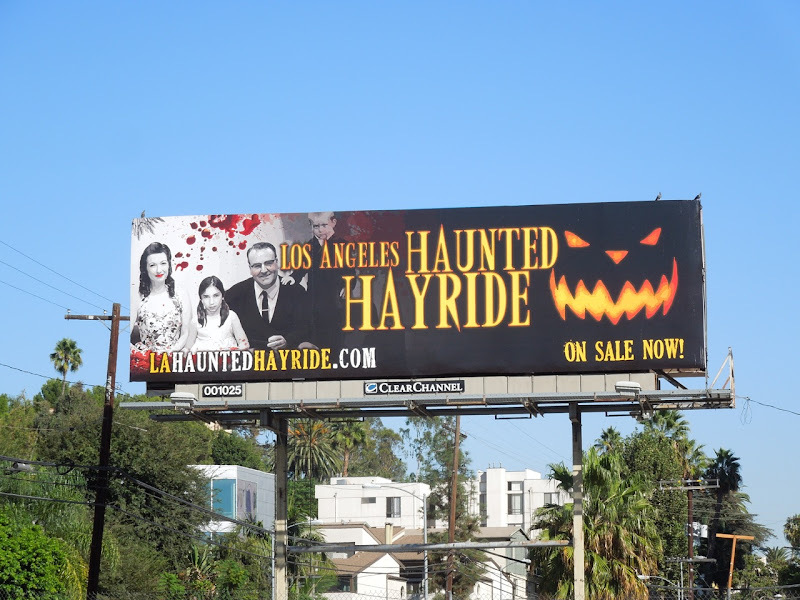 Be sure to check out 2011's Los Angeles Haunted Hayride billboard for another ad creative for Griffith Park's Halloween attraction. 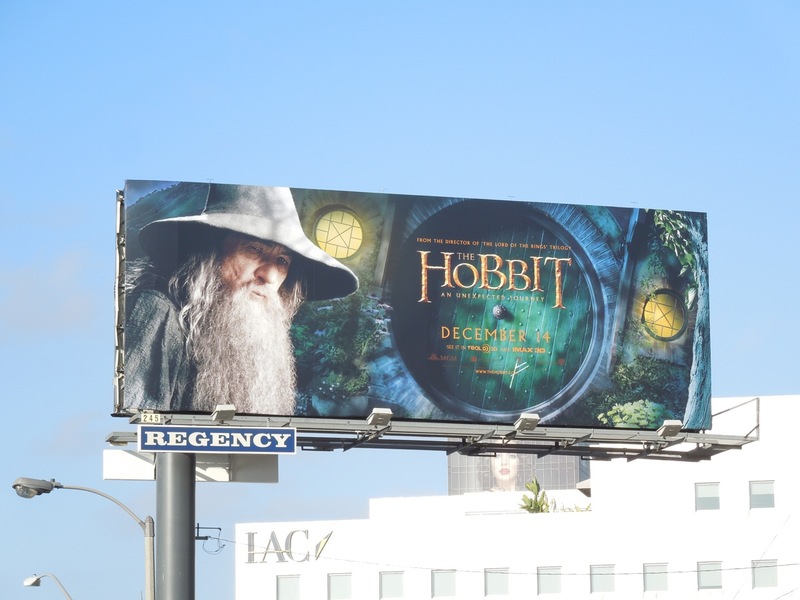 Just one more sleep until the witching hour. 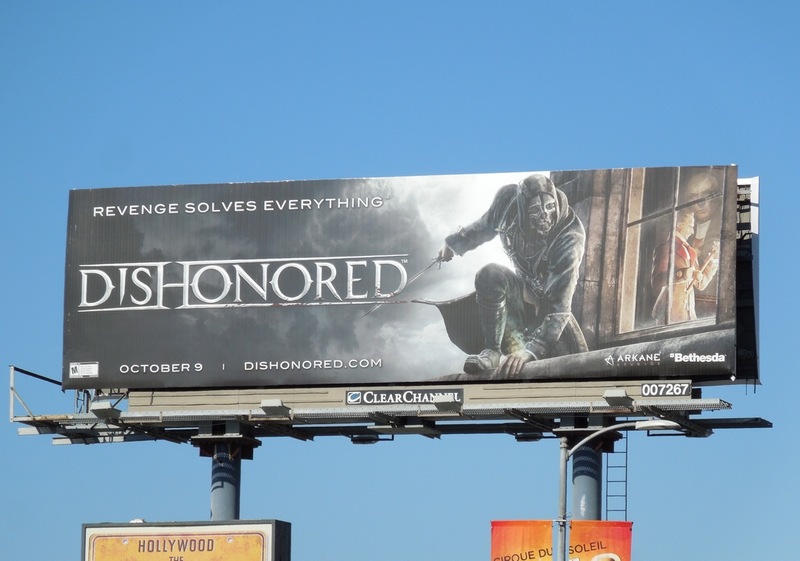 The countdown to Halloween begins here with these slightly creepy and menacing billboards for the video game Dishonored. 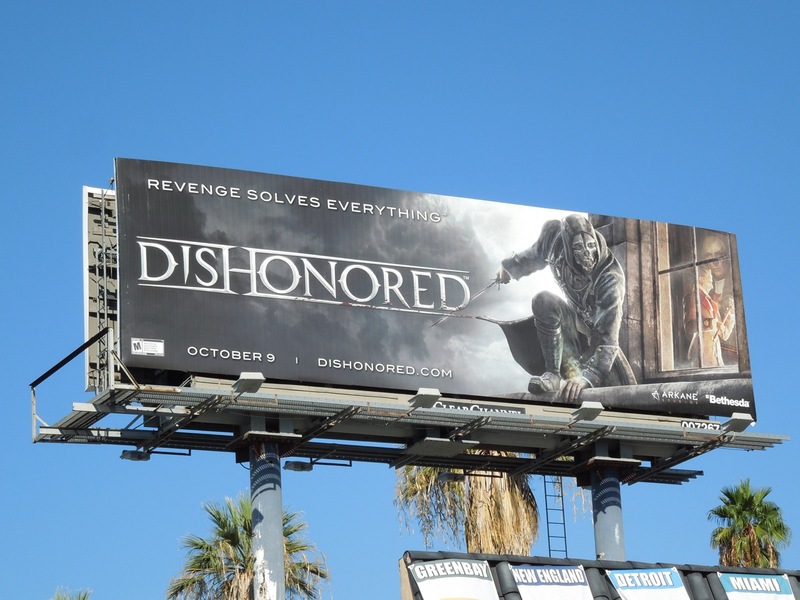 The first-person stealth action-adventure video game has been a critical hit garnering lots of positive reviews. 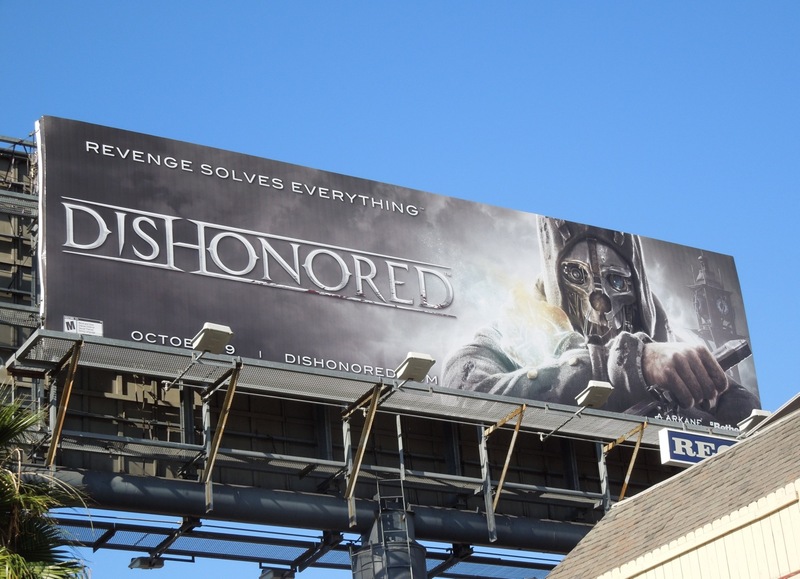 In a fictional city modeled after Victorian London, the game follows the exploits of 'Corvo Attano', a legendary bodyguard for the Empress who has been framed for her murder and is driven by revenge against those who betrayed him. 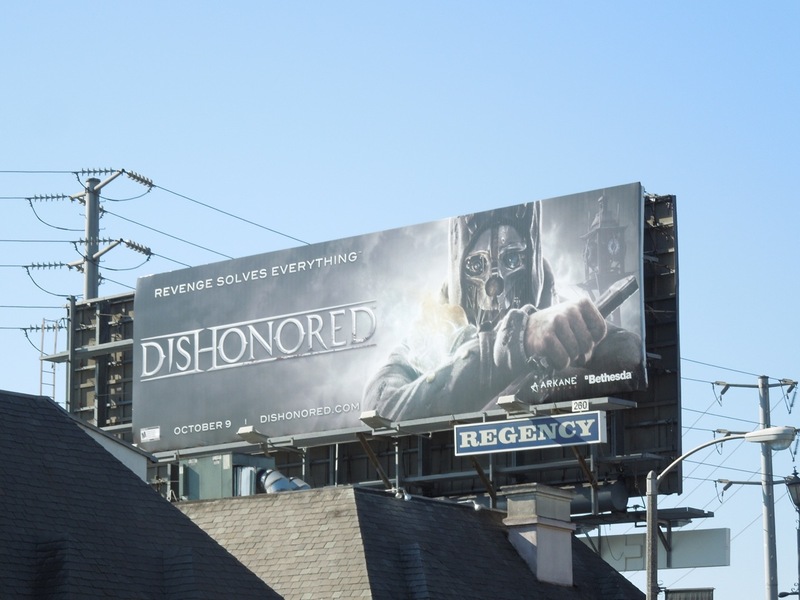 With his disturbing mask his calling card, he looks every bit the classic horror villain from a scary movie. 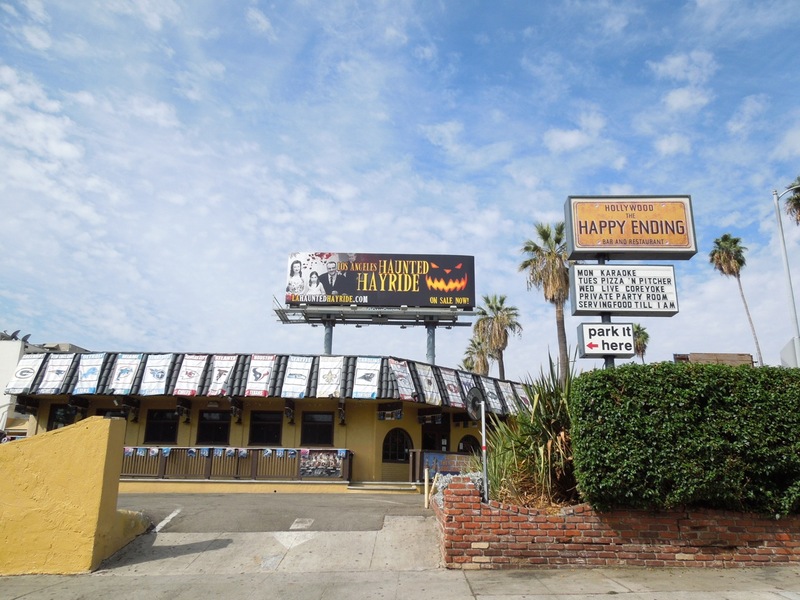 The window ledge creative was snapped above Hollywood's Happy Ending bar and restaurant along Sunset Boulevard on September 15, whilst the smaller mask creative was spied further west along the Sunset Strip on October 1. 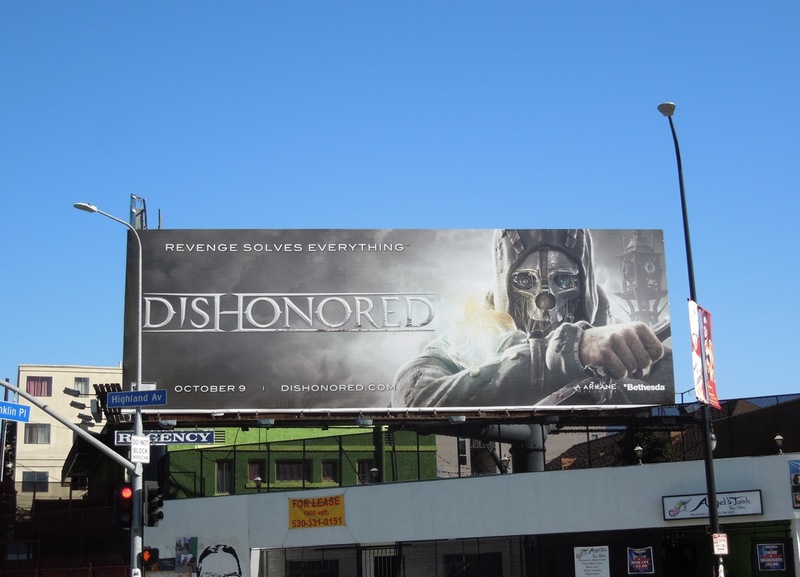 Meanwhile, the larger mask creative was spotted at the busy intersection of Highland and Franklin Avenues on October 26, 2012. 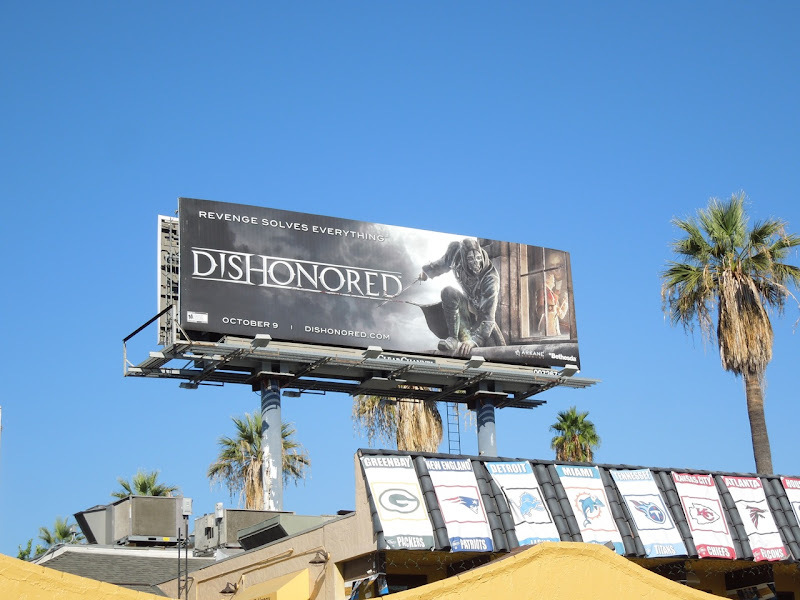 Be sure to check out more cool video game advertising here at Daily Billboard. 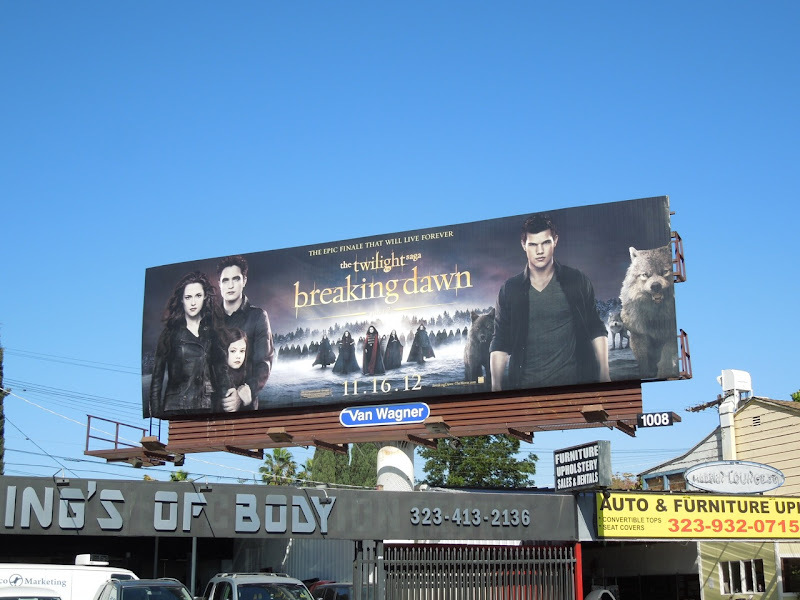 The end is nigh and The Twilight Saga is almost over on the big screen. 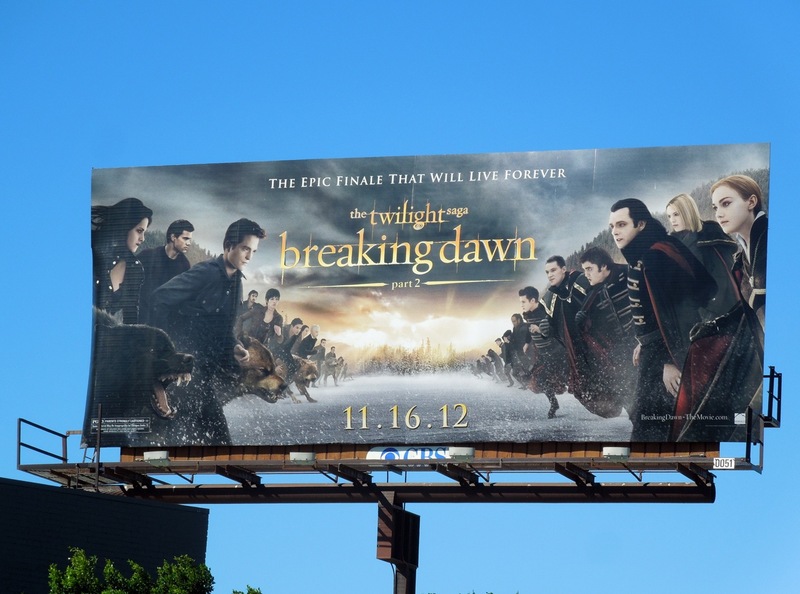 Will you be breathing a sigh of relief or shedding a tear or two over the finale of Breaking Dawn Part 2? 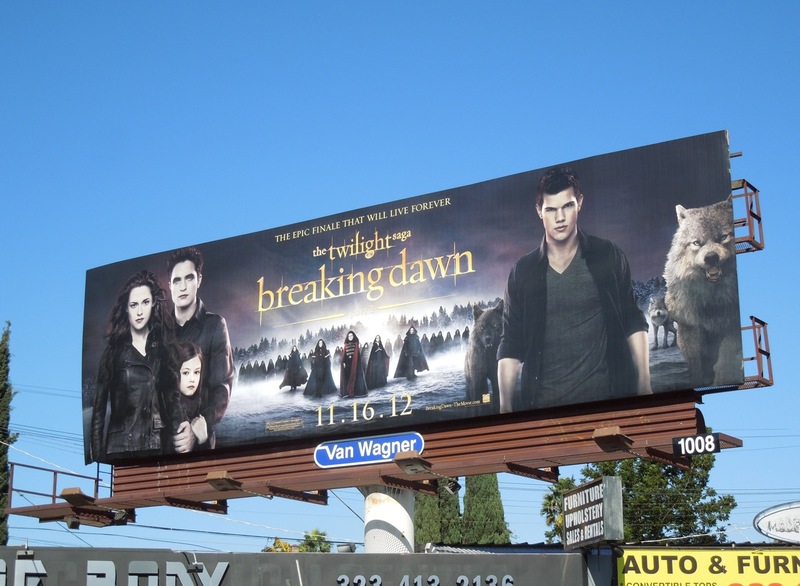 Fans of Stephenie Meyer's best-selling books will already know how the love story between 'Bella Swan' and 'Edward Cullen' ends, but from the looks of these billboards there'll be lots of vampire and werewolf action before the couple, and their new daughter, can live happily ever after. 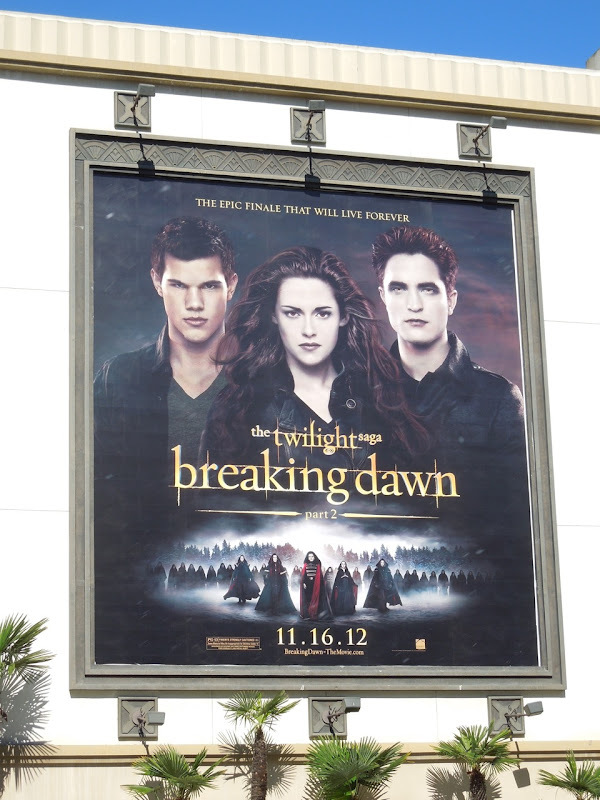 The other questions on everyone's lips is whether Kristen Stewart and Robert Pattinson will stay together off screen after all the publicity for this final installment is over, and whether they along with Taylor 'Jacob Black' Lautner can have a successful career beyond the Twilight movie franchise. 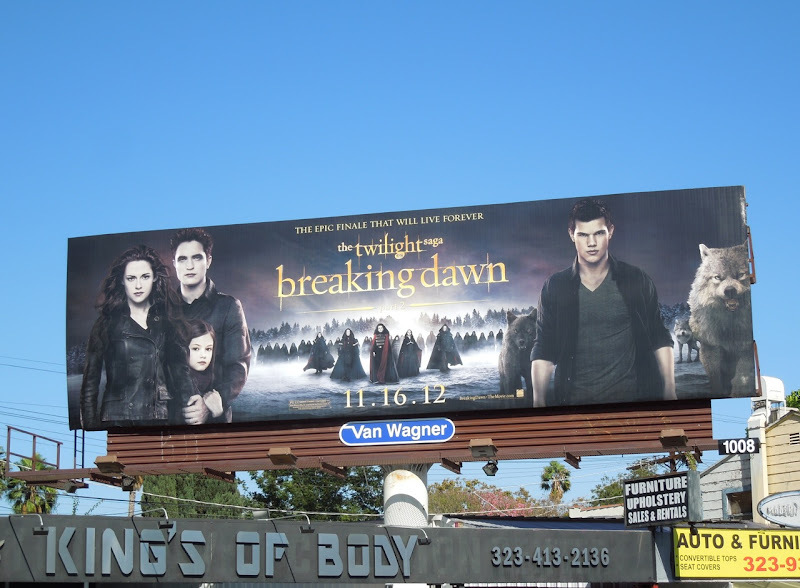 As none of their respective solo projects - Snow White & the Huntsman, Water for Elephants or Abduction has proven to be a box office smash yet. 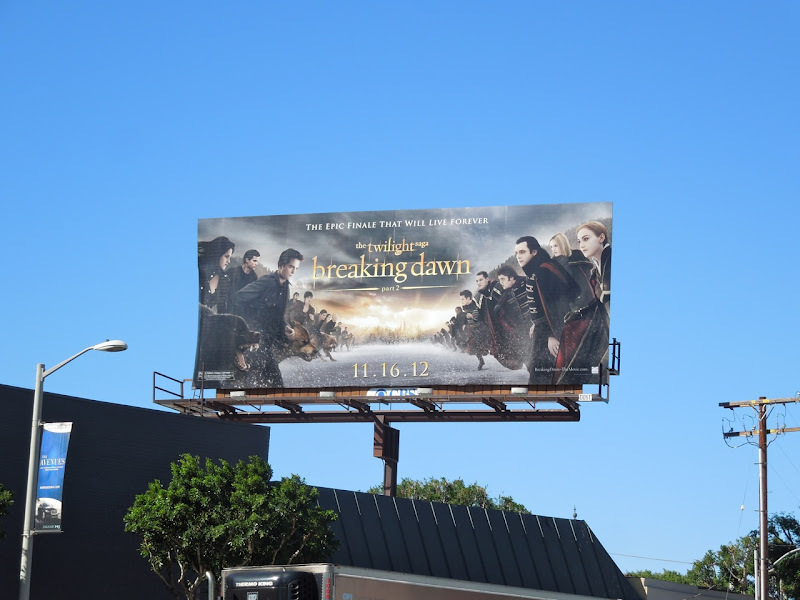 These billboards for the final chapter in the saga were snapped along 3rd Street on the side of The Grove shopping centre, plus along Melrose Avenue and Beverly Boulevard on October 25, 2012.
and The Twilight Saga: Eclipse movie billboards. 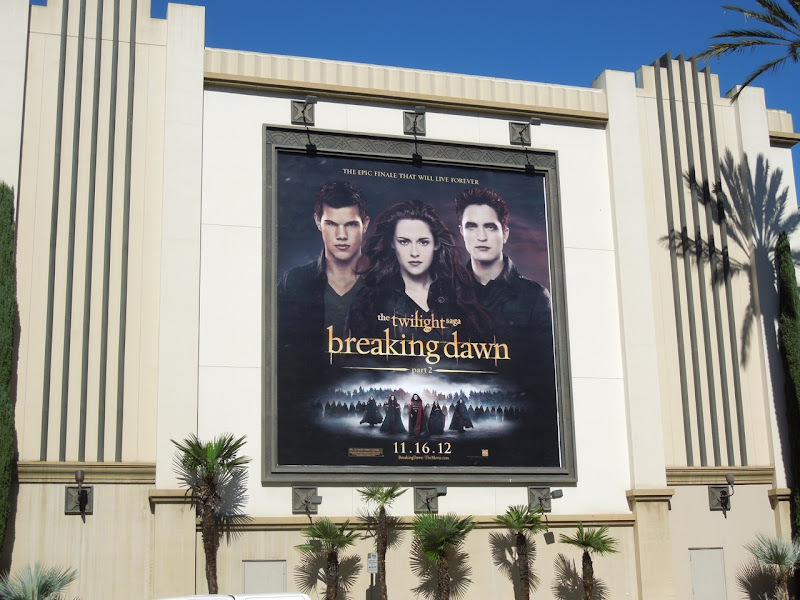 Plus take a look at all these original costumes and props from the Twilight movies on display. 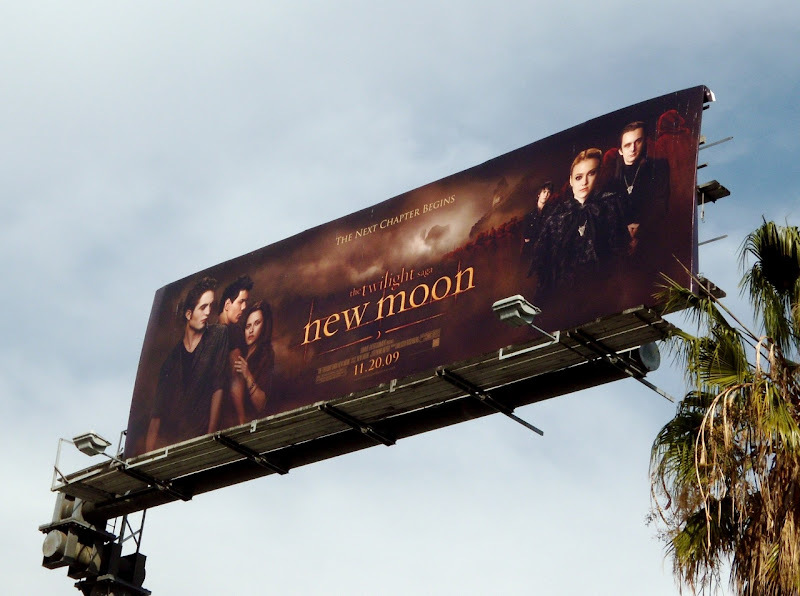 As a special bonus here's also a billboard for The Twilight Saga: New Moon snapped in L.A. in November 2009, which introduced the powerful coven of vampires, the Volturi. 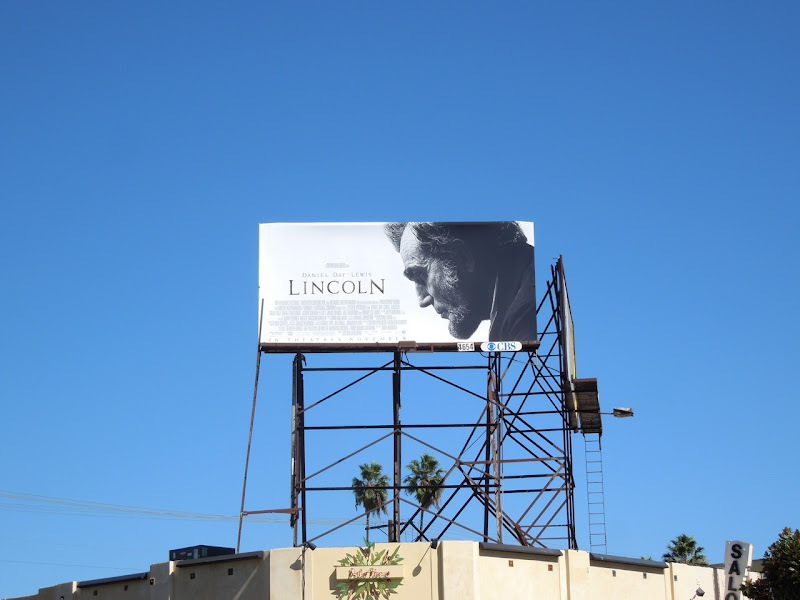 In Hollywoodland it's not unusual for there to be two movies about the same historic figure released in the one year, but if the supernatural fantasy Abraham Lincoln Vampire Hunter wasn't your cup of tea, maybe Daniel Day-Lewis' portrayal of Lincoln will be more to your liking (and historically accurate). 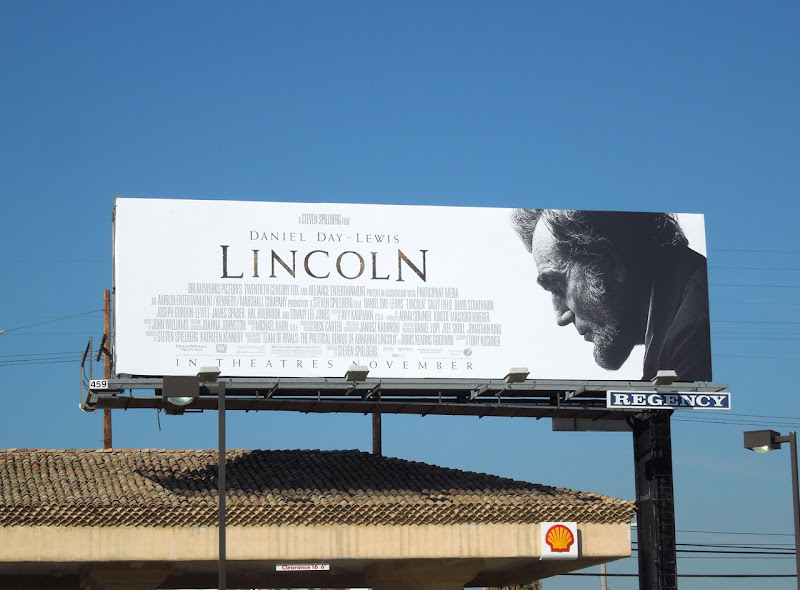 Obviously when an Academy Award-winning actor like Daniel Day-Lewis plays the 16th (and one of the most recognizable) President of the United States, and is directed by an Academy Award-winning director like Steven Spielberg, you just know there's going to be some serious Oscar buzz surrounding this movie. Add to the fact this is a Presidential Election year and there's never been a better time to release a biopic drama like this. 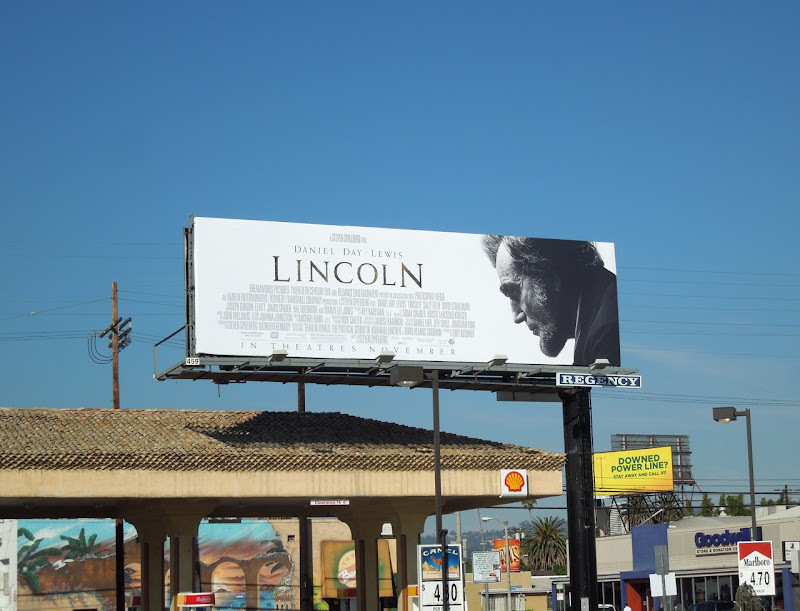 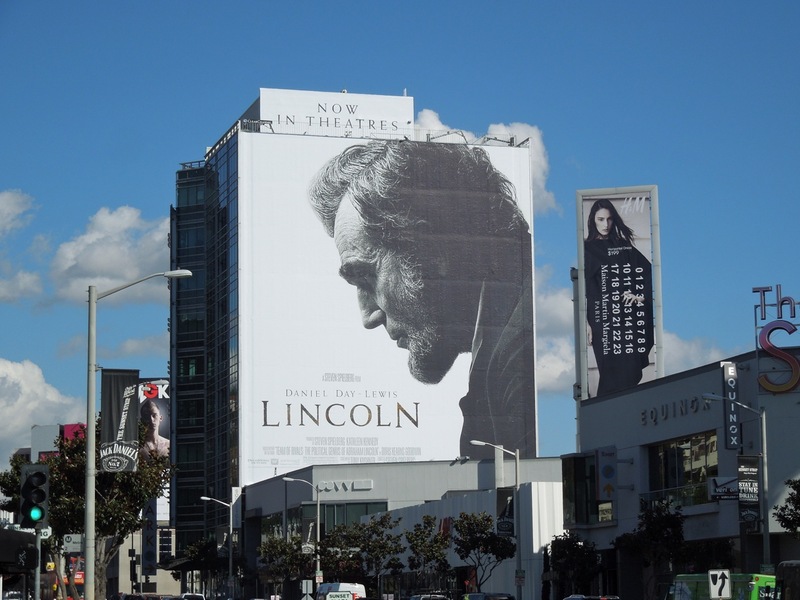 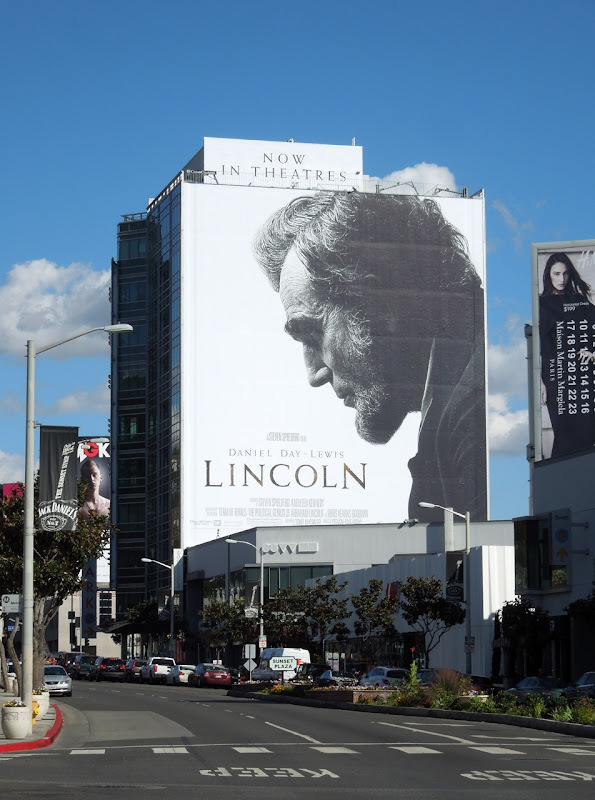 These evocative billboards for Lincoln were snapped along Beverly Boulevard, Fairfax Avenue and Melrose Avenue from October 13 to October 24, 2012. 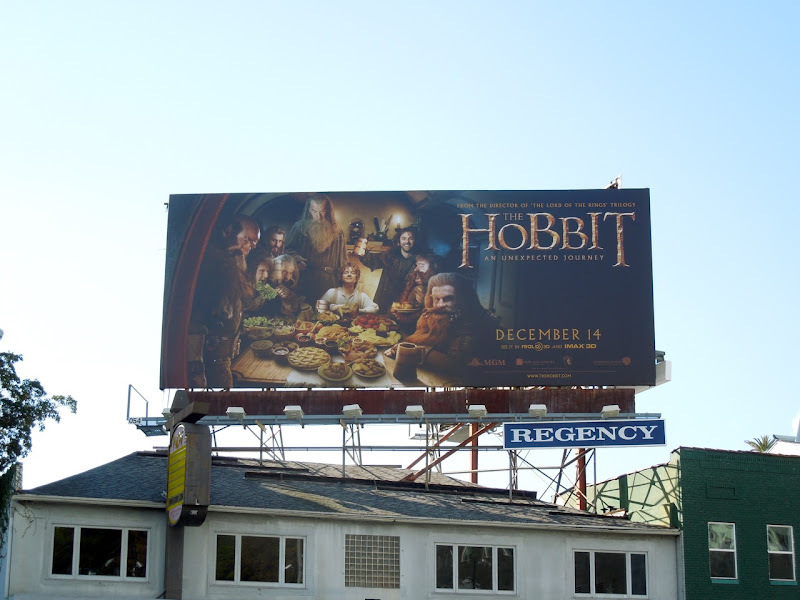 UPDATED: To add some extra marketing muscle behind the opening weekend, here's a giant-sized billboard for the movie snapped along L.A.'s Sunset Strip on November 9, 2012. 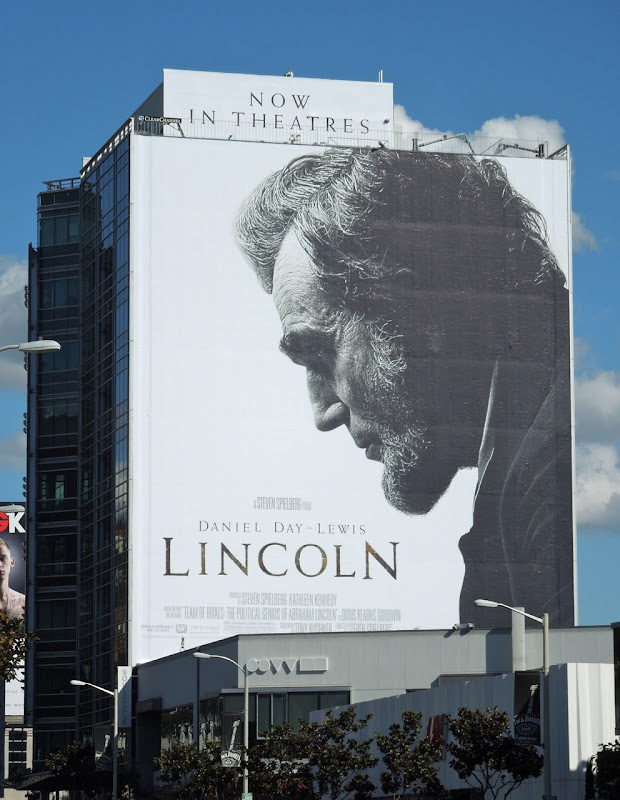 The question will be can this epic historical drama about the popular U.S. President beat the dashing British Secret Service Agent, 007, in Skyfall at the box office, or will audiences be looking for some pure escapism after the months of focus on politics in the recent Presidential Elections. 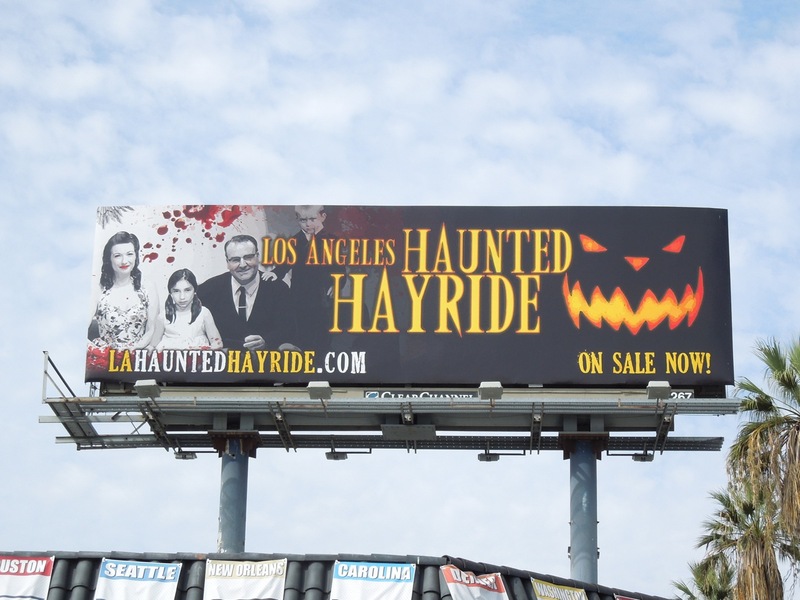 Halloween is almost upon us and here's a comedy to get you in the mood for the spooky season. Fun Size follows the fortunes of high schooler 'Wren' (Victoria Justice) who loses her oddball younger brother 'Albert' when out trick-or-treating. 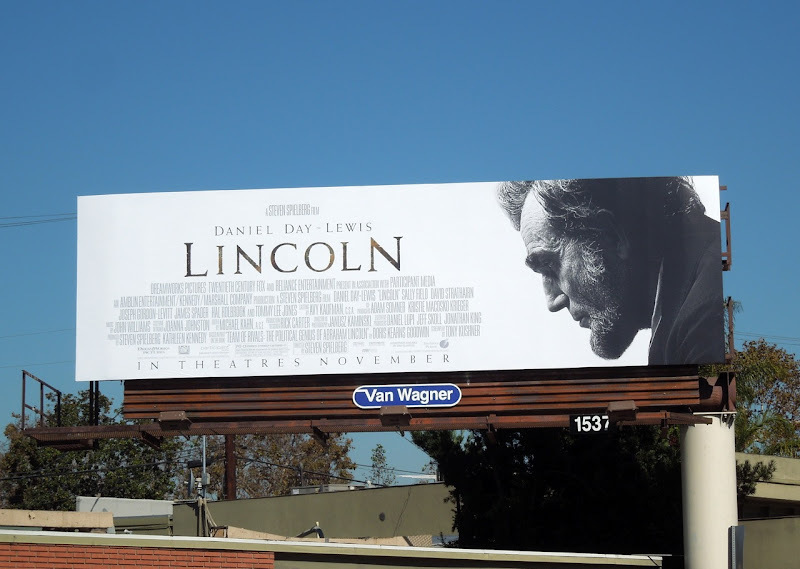 With her best friend (Suburgatory's Jane Levy) and two nerds in tow she sets out to find her missing brother before her mother finds out. 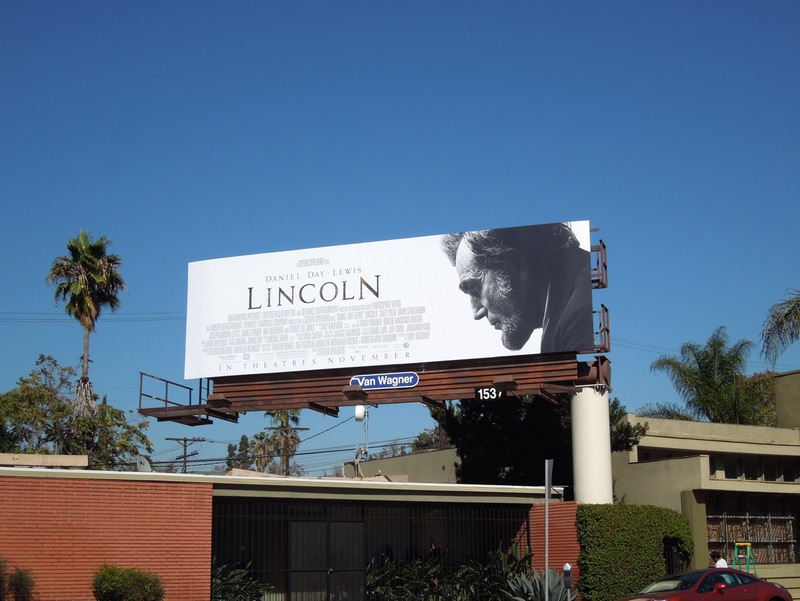 This movie billboard was spotted along Beverly Boulevard at Laurel Avenue on October 2, 2012. 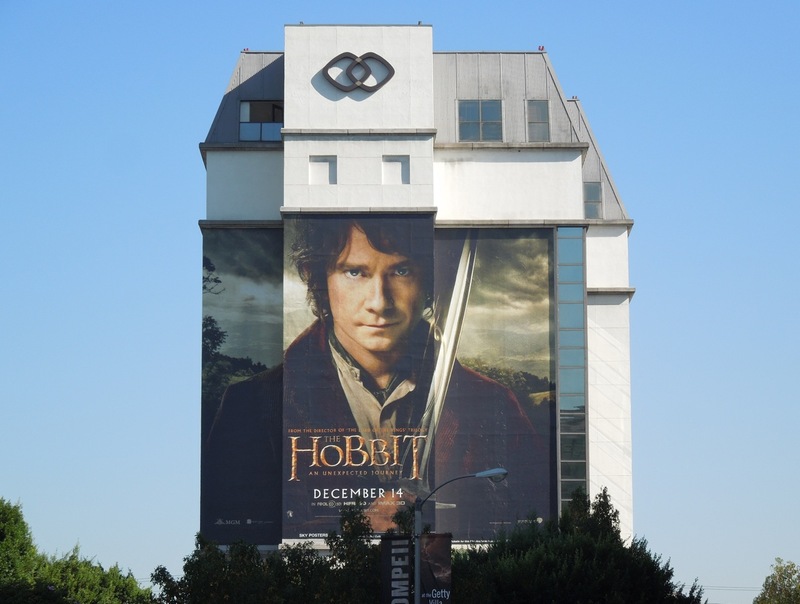 It looks like your candy won't be the only thing to be fun-size this Halloween. 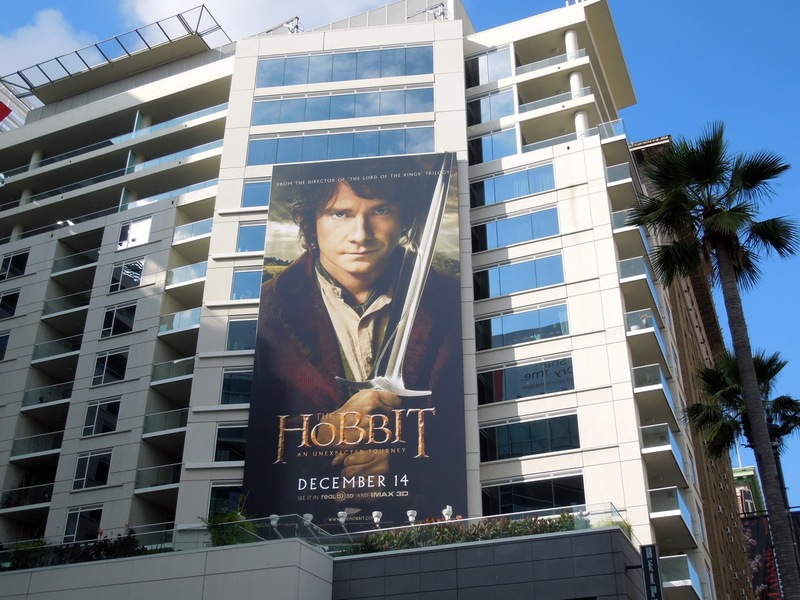 For three consecutive years Peter Jackson wowed the world with The Lord of Rings trilogy, but can he make magic happen again with his new trilogy for The Hobbit. 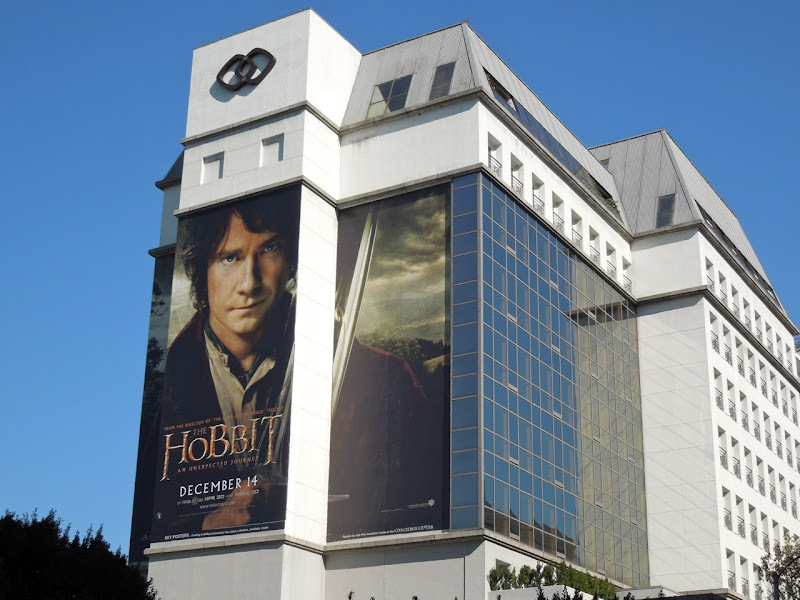 One of the questions will be, is there enough content to fill three movies and will The Hobbit just be more of the same (not that that's necessarily bad), or can it capture our collective imagination in new ways. 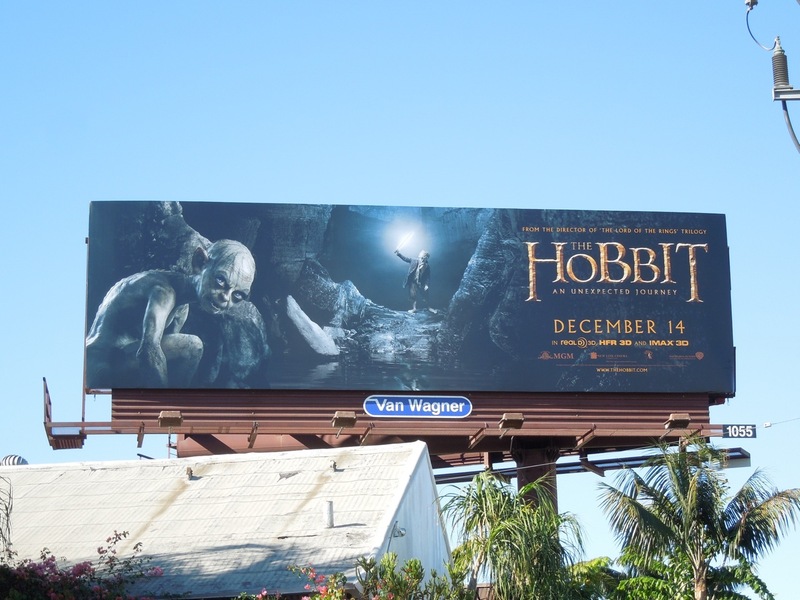 If anyone can do it Daily Billboard is confident that the director will deliver another three epic fantasy films (obviously the less said about his King Kong remake the better). 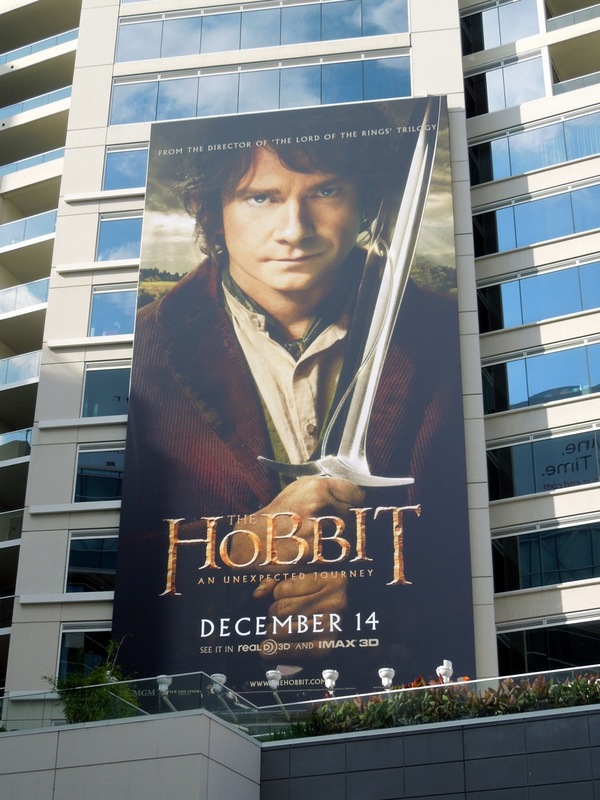 In these prequels, Ian MacKellen returns as the wise wizard 'Gandalf' and Martin Freeman takes the reins from Ian Holm as the younger, titular Hobbit, 'Bilbo Baggins'. Along with elves, dragons and the other magical creatures of Middle-Earth, you can expect a whole host of dwarves to take center stage as Bilbo's traveling companions. 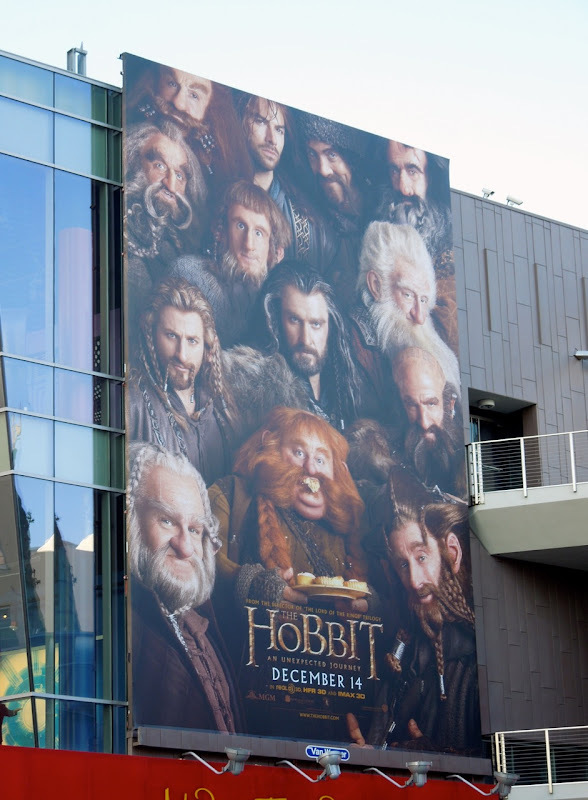 In this first installment entitled The Hobbit: An Unexpected Journey, our diminutive hero sets off with his thirteen dwarven allies to the Lonely Mountain to reclaim a stolen treasure from the dragon 'Smaug'. Not to give anything away, but the next movies will be sub-titled The Desolation of Smaug and There and Back Again, released in 2013 and 2014 respectively. 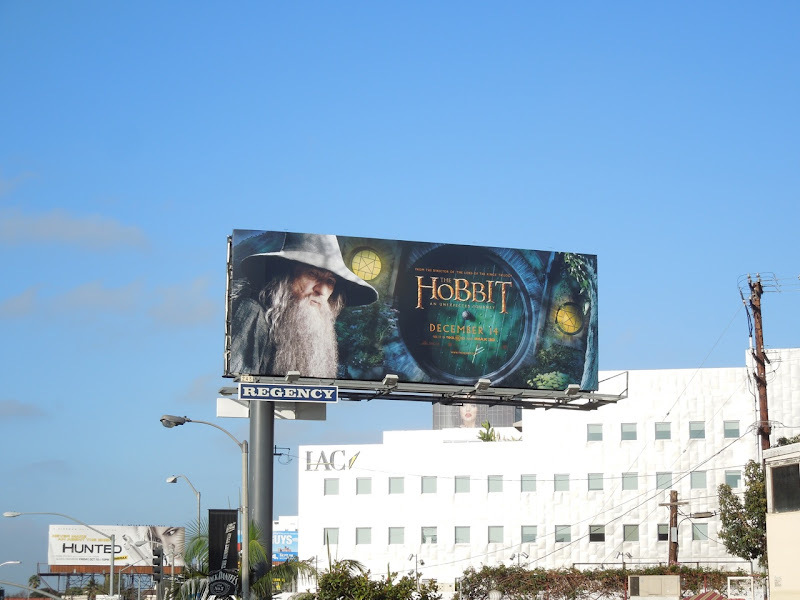 These billboards for the first movie, featuring an assortment of familiar faces and races, were snapped around the streets of L.A. from October 10 to October 23, including an early portrait teaser featuring Gandalf snapped at Warner Bros. Studios in Burbank on August 26, 2012. 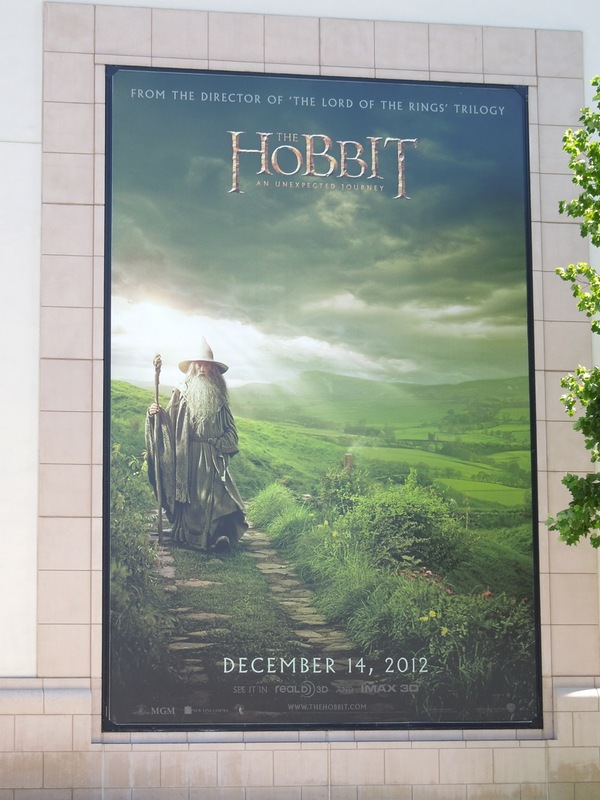 Let's hope these new cinematic installments will be as precious as the first trilogy of LOTR movies were. 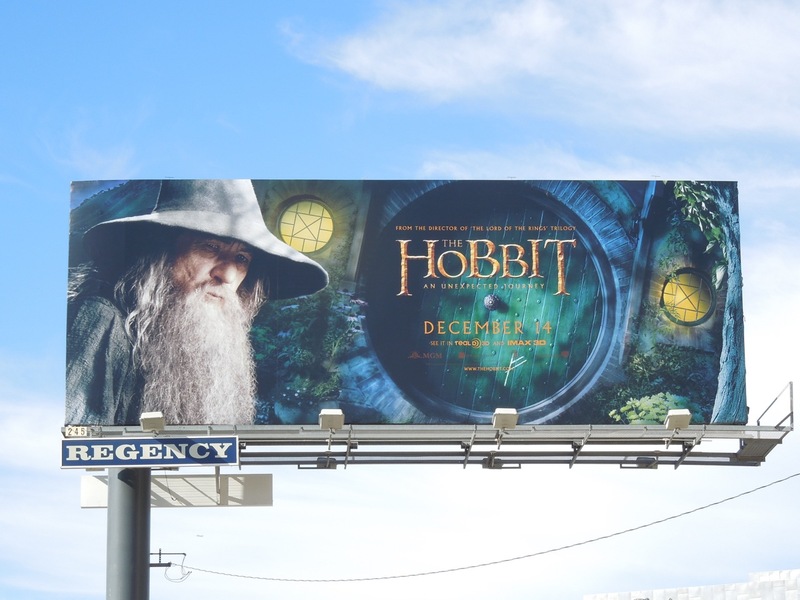 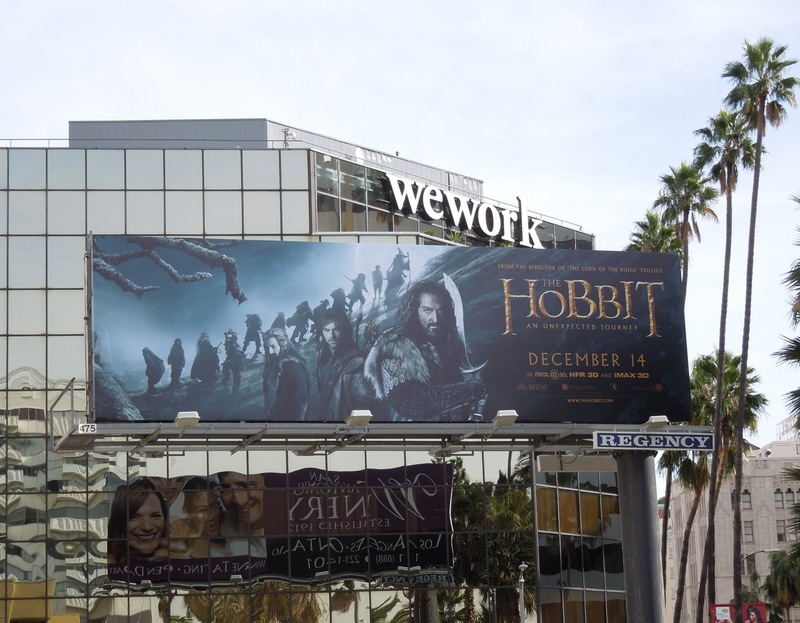 UPDATED: Check out this super-sized billboard that has sprung up in recent days for the first installment in The Hobbit trilogy. 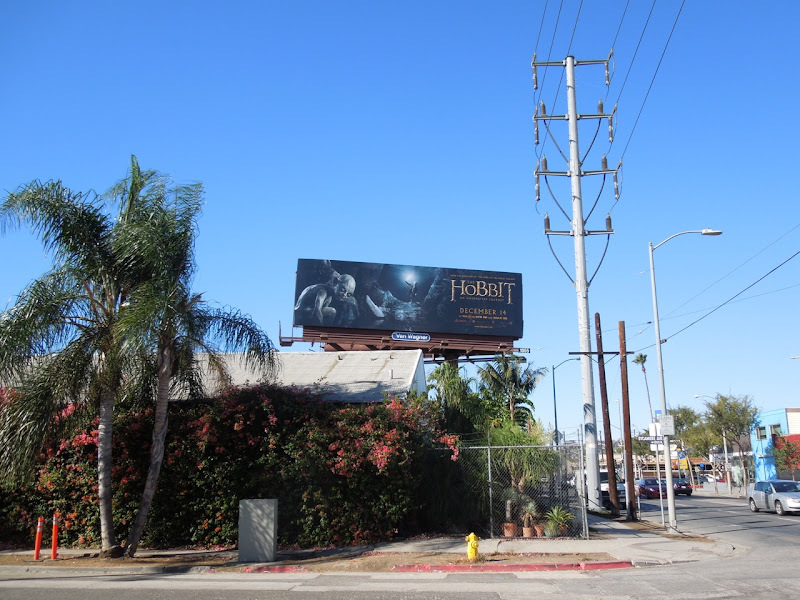 This impressive ad featuring Martin Freeman and Bilbo was snapped on the side of the Sofitel Hotel along Beverly Boulevard on November 6, 2012. 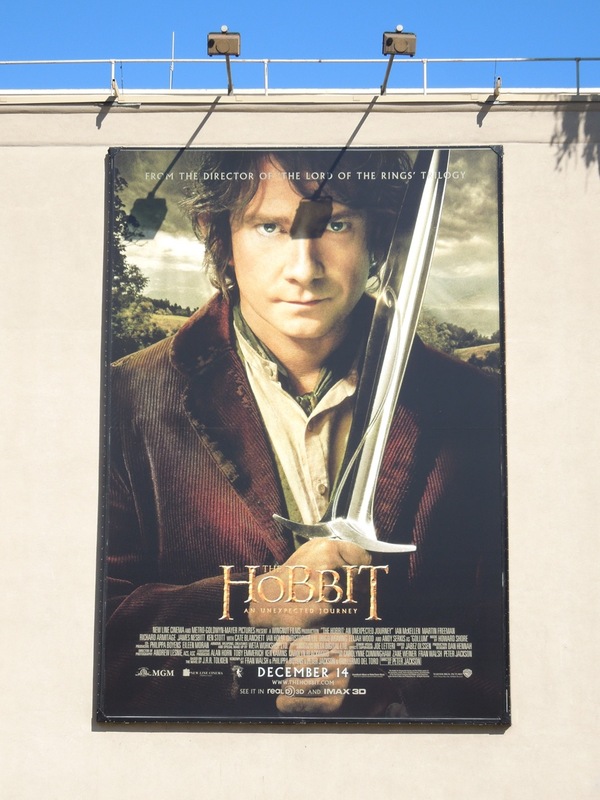 Plus here's a new creative featuring fan-favourite 'Gollum' in the glow of Bilbo's sword 'Sting'. This cool billboard was snapped along Santa Monica Boulevard on November 11, 2012. 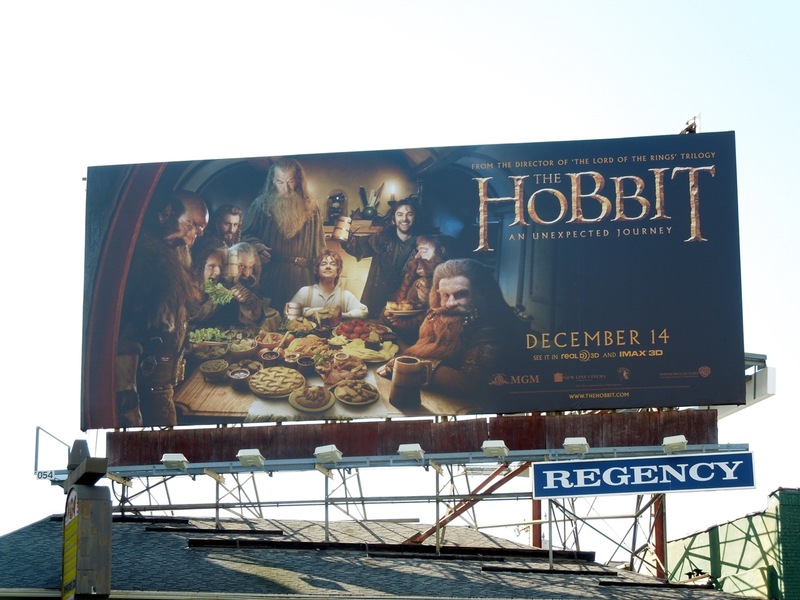 UPDATED: More creatives are appearing as the release date for the movie gets nearer, here's another billboard snapped at La Brea Avenue and Hollywood Boulevard on November 14, 2012. 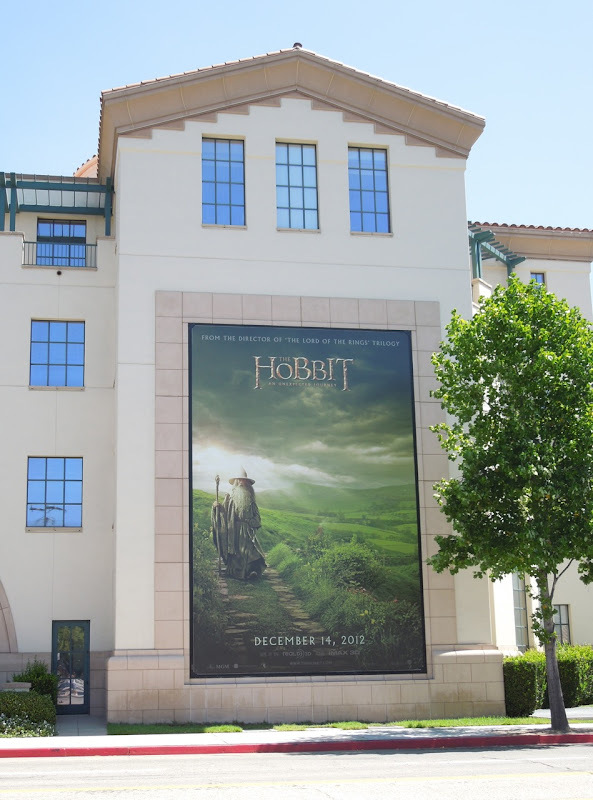 UPDATED: Yes Warner Bros. Studios have spared no expense marketing this first installment in The Hobbit trilogy, obviously hoping for a similar LOTR cash cow. 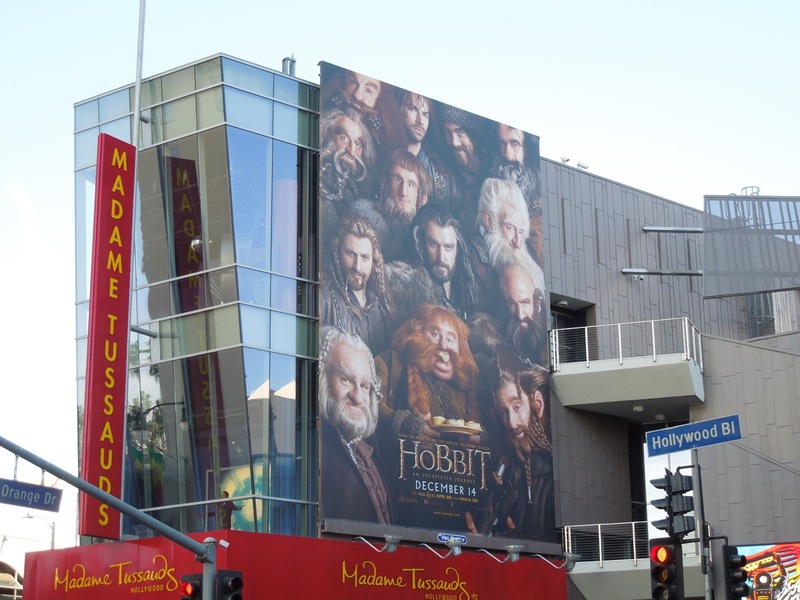 Here's another extra large billboard, this one focusing on the Dwarves, on the side of Madame Tussauds Hollywood along Hollywood Boulevard on December 5, 2012. 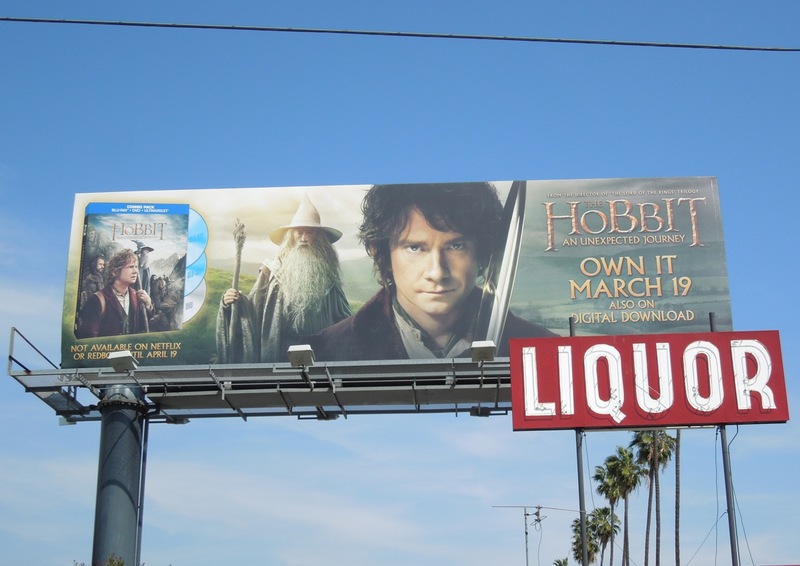 UPDATED: For the Blu-ray release of the movie it seems that they've combined a few of the theatrical release creatives, like in this billboard snapped along Sunset Boulevard on April 3, 2013.